Houston Headshot Portrait Photographer, Michael Carr, CPP, is a portrait artist that specializes in business executive portraits. We are a Texas based commercial portrait studio serving the Houston metro areas, and travel to Texas cities to photograph business owners, executives, and board of directors in Victoria, TX, Austin, TX, Port Lavaca, TX, Port O’Connor, TX, El Campo, TX, Katy, TX. As a professional portrait photographer in the Houston Metropolitan area for over 20 years, our work is widely used in oil and gas industry, financial annual reports and commercial real estate marketing press packets, PR packets, investor kits, board of director bios. Your business headshot can also be used on social media sites that require a headshot image. Social media sites such as LinkedIn, Facebook, Twitter, Instagram, Pinterest, all keep you connected with your contacts and in front of them 24/7. Houston business headshot portrait photographer, Michael Carr, creates a new blend of corporate styles for local executives seeking a competitive edge in the corporate arena. When it comes to your digital presence, you have about 6 seconds to captivate your audience. Whether you are generating new business, networking online, or seeking career opportunities, your online headshot will determine if you are worth a look, a click, and possibly a call for engagement. Don’t make a rookie mistake and skip the opportunity to sell yourself through a strong digital presence. Understand the key principles of digital communication and you can leverage your professional image to effectively market yourself. Experience the difference for yourself, we offer a unique product where image is everything. 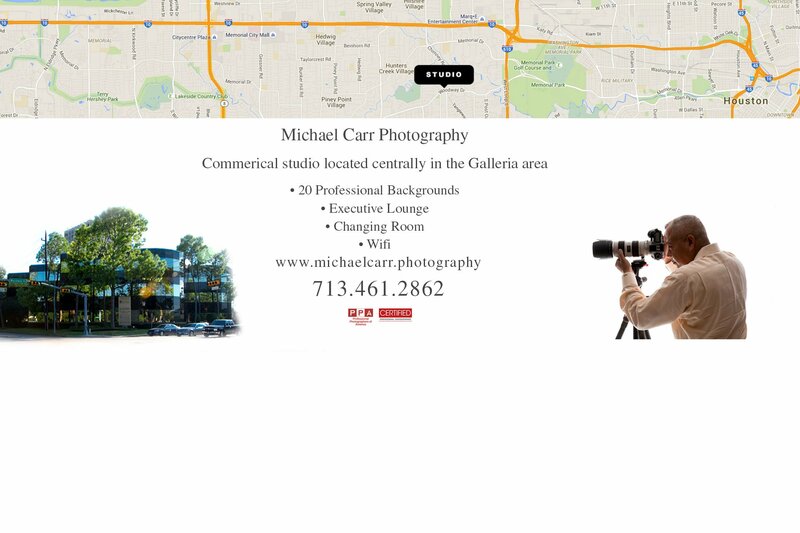 Our studio is located in a commercial office building near 610/Woodway. The studio is equipped with commercial grade lighting equipment; a variety of professional photography backgrounds, dressing rooms and digital workstations customized for most digital pre-press requirements. Clothing consultations are complimentary and hair and makeup salon services are available upon request. Our location executive portraits include a traveling radius of up to twenty miles from our Houston, TX studio. If your facility is outside that radius, please call us. For a modest additional fee we wil accommodate locations in Sealy, Galveston, Columbus, The Woodlands, Galveston, Conroe areas in or order to get you the portrait or headshot you need. With two major airports in Houston, we can also travel by air to accommodate your business requirements.